Jason Godfrey, an English teacher from Arizona, cools down and hikes up in Boquete, Chiriqui, Panama. for two weeks seemed like just the escape I was looking for with exotic beaches and inviting waters, corals and fish of all different colors, and a sleepy island lifestyle—a salve for long weeks and the late nights of grading as an English teacher. However, as the end of the year crept closer, I discovered, following the balmy Bocas “feels like 103 degrees, thunderstorms in the afternoon ” weather day after day on my laptop, that I might also need a respite from my tropical respite. Hunting around for things to do in various Panama guidebooks and websites I found the little pueblo of Boquete, Chiriqui, where all promised “spring-like weather year round.” A mountain break from my Caribbean getaway—vacation excess! So, I made some investigations into places to stay in Boquete on a generic Google search and with my favorite Airbnb.com worldwide lodgings and made note of some reasonably priced options for a little sprint up to the mountains in the middle of my two-week stay in Bocas. My secondhand Fodor’s guidebook, five years old, warned of mountain roads easily washed out by seasonal rains between Bocas del Toro, on the Caribbean side of Panama, to Boquete (pronounced BOkehtA), located at the base of Panama’s highest peak, the 12,000 foot Volcano Baru, near the border of Costa Rica. A four-hour bus ride in a clean Greyhound-like coach (<$10 US) would spirit away travelers around the mountain roads if they were impassable and make a stop first in David, on the other side of Boquete, and then a short thirty minute jaunt up the hill to the valley where Boquete lies at the base of the volcano. After a sweltering week or so of Caribbean water and sun and small town life in Bocas (the semi-daily crowing of roosters across town like a celebrity voice-off competition, and nightly squabbles of the family next door), I was indeed ready for a little escape. 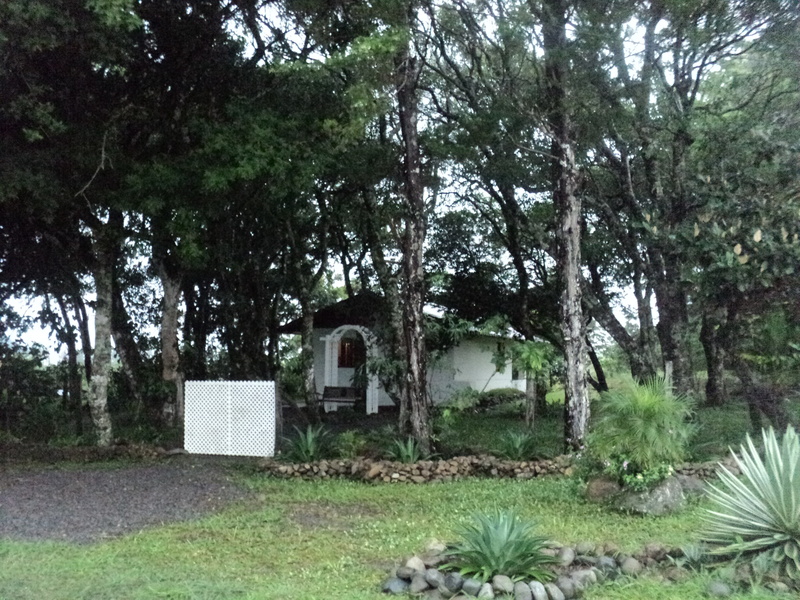 I booked a little cabin just outside of Boquete proper through Airbnb.com at a moderate $55 a night for the weekend. 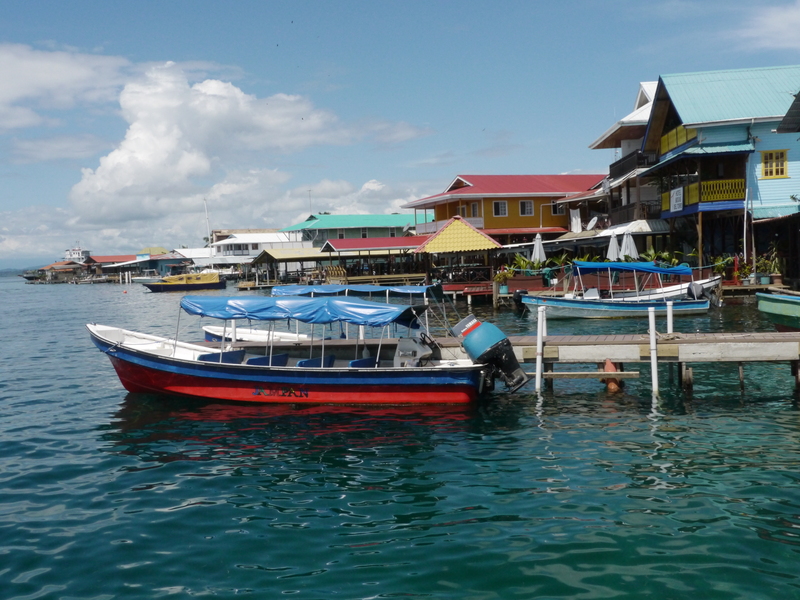 And, to my delight, I discovered a direct shuttle, making only one stop for food and a bathroom break, run by the Hostel Mamallena in Boquete, in conjunction with the Bocas Marine Tours on the Bocas waterfront. For $30, a water-taxi at the BMT dock will take passengers directly to the Puerto Almirante, on the Panamanian mainland (a twenty-minute transport), to a waiting shuttle (equipped with wi-fi and comfortable spacious seats no less). The trip takes between 3-31/2 hours, depending on the rains. My Boquete host, Ulises, arranged to pick me up at the central park, just across the street from the Hostel Mamallena. With plenty of room available in the shuttle I spread out across a couple of seats and true to form, warm rain poured from the sky as we made our way across the verdant mountains, passing over dams and by little farms complete with thatched huts and casitas adorned with the customary tin roofs. Gazing out the windows I scanned the treetops for the three-toed sloth and parrots of Panama. 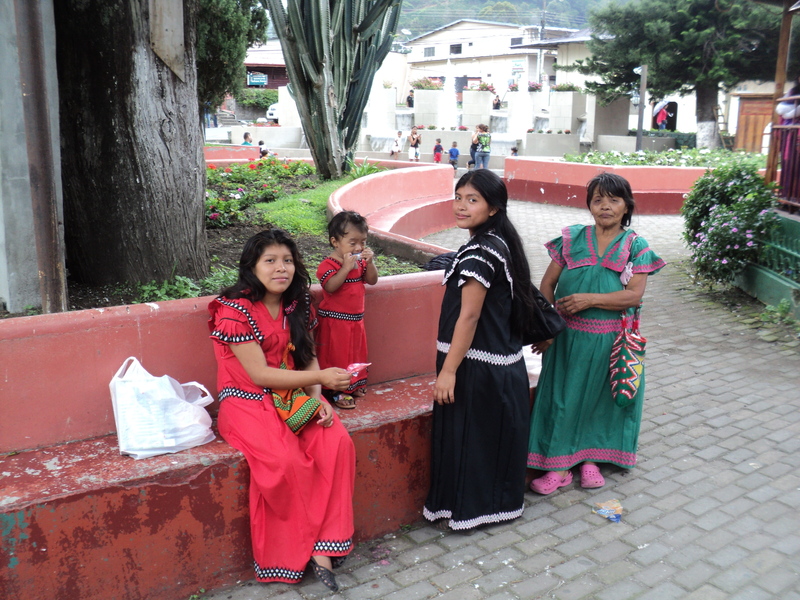 In what seemed like no time at all we pulled up to the central park in Boquete. It was still raining. 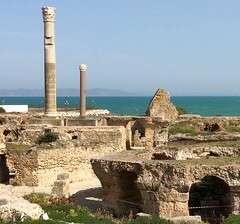 I grabbed my gear and disembarked the air-conditioned shuttle, took a step or two away from the vehicle, and looked about the watery scene before me as people scurried about the charming little plaza and small cars passed to and fro. My glasses clouded up with fog, and as I paused for a moment to clean them, I heard Ulises, calling to me from across the street, motioning for me to get into his truck and out of the rain. Off we sped up the main road through town past a blend of typical small Panamanian tiendas and mercados, interspersed with modern buildings and businesses you might find dotted about Phoenix. Boquete, featuring such splendid weather and natural beauty, has become the home of expatriates from all over the world, notably the United States and Canada, over ten thousand strong. With them, they have brought many conveniences and luxuries probably relatively unknown to other towns of this size in Panama. Signs of economic prosperity abounded in the mixture of old and new as we glided along, snaking through roadwork to expand the highway to several more lanes between David and Boquete. Others make their way to Boquete from Panama City and San Juan by way of plane to David, short flights, and then transfer to buses or cars for the short half-hour drive up the hill. Ulises gave me a short orientation as we drove up to my lodgings in Alto Boquete, a neighborhood ten minutes drive from the central park and serviced regularly by little minibuses that charge approximately $1.20 each way for transport back and forth from town. stood nestled into the corner of a little grove of trees just a quarter mile off the highway. Birds sang from the trees and water ran in the channel behind the house and we noted the afternoon’s rain was beginning to fade. The temperature felt comfortable and the humidity was not oppressive like an afternoon shower in Bocas. The enveloping smell of cedar drew me into the cabin and happily I threw the blinds and glass doors open and walked out onto the porch to take in the sights and smells of the grove off the balcony. Rain fell in little drops here and there. Dropping off my bags, Ulises and I made our way back along the main road to a supermarket and a café for some basic supplies and a little roasted chicken dinner. Returning to the cabin, I spread out my dinner and relaxed on the porch with a bottle of Chilean wine. Birds frolicked in the trees above the wash and the clouds began to abate. I kicked up my heels and enjoyed the cool as night set in. Ulises met me with his vehicle mid-morning the next day, a Saturday, as we had arranged and gave me a lift across town to the foot of the Volcano Baru, an area known as Bajo Mono, also serviced by taxis running back and forth to Boquete. 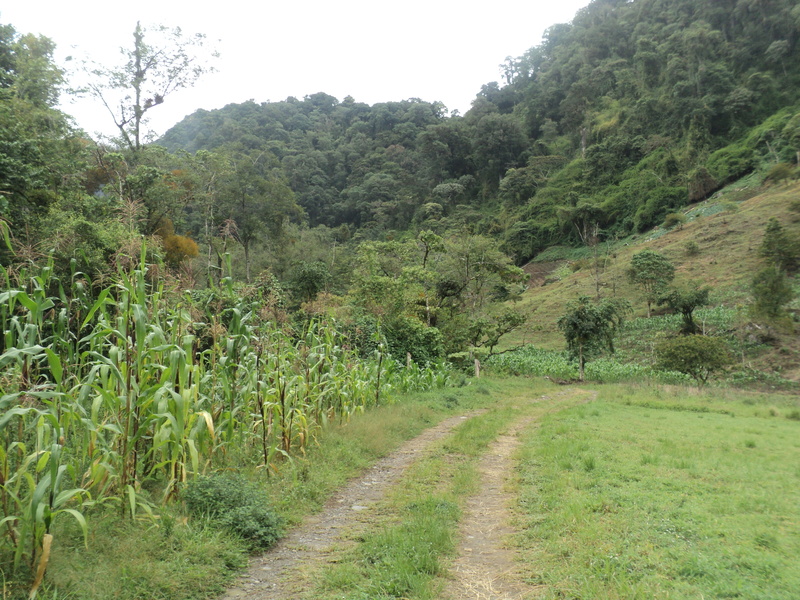 And so we raced along and up a winding mountain road passed little compounds of houses, a baseball stadium, and coffee farms until we reached the edge of the property. The hike, “Hidden Waterfalls Trail,” ventures through private property and a $3 usage fee is required at the trailhead. Fields of maize stood in geometric patterns at the mouth of the trail, creeping their way up the steep slopes of the canyon in ordered rows. Workmen hammered and chopped in the distance and the sounds of the little brook rushing through the canyon drew me onward. The trail rose steadily past the working farm, assuming the look of an old road and ran beside a thicket of trees flanking a little stream. Following it up a constant incline, the thicket became rainforest, hiding little waterfalls, inviting brief stops to explore little trails through the thick underbrush to the rushing creek. Passing a couple along the way, their local guide crept into woods and emerged with a little spiky fruit that he opened with a knife. He told us it was a relative of the orange and offered us bits to taste: a bit tart but interesting nonetheless. The thick forest ahead grew taller and more immense as the trail rose and the canyon walls began to close in. Great canopied trees loomed above, perhaps 150 feet tall, draped with vines and decorated with parasitic foliage blooming in orchids and other flowers. A light drizzle began to settle in as I made my way to the first crossing, a crooked bridge spanning the rushing stream like a giant Erector set. I trod on, stopping occasionally to acclimate to the altitude and rest tired legs, weary from the gradual constant climb into the canyon. 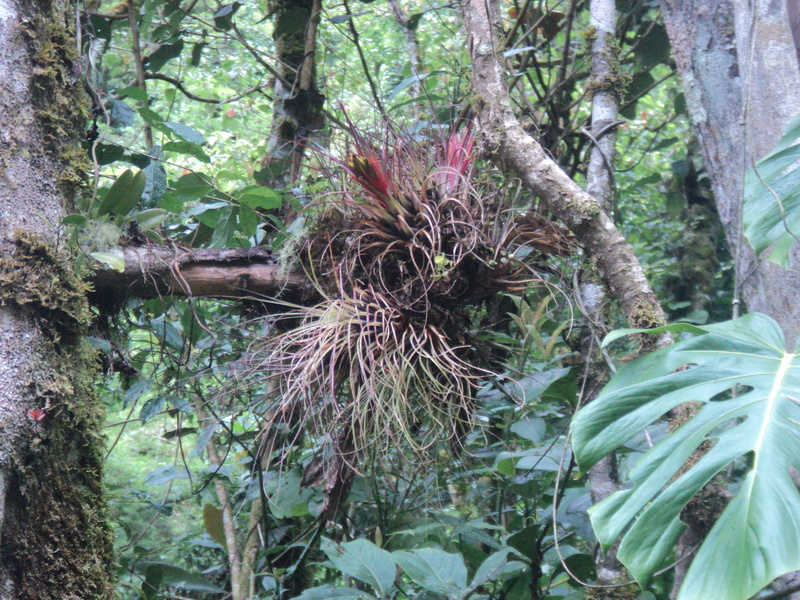 As I made my way deeper within, the forest closed in on the trail and the immensity of the canopy so high above gave a slight dizzying effect as I scanned the giants for signs of the elusive resplendent quetzal and howler monkeys. Crossing the stream a few more times the trail opened into a small clearing underneath the towering greenery. Rough hewn benches offered a good opportunity to relax and catch my breath with the hope of spotting the quetzal. Peer as I might, I never saw the bird, though a group passed through with a guide pointing high up into the trees, and his clients all nodded their heads in approval. They passed by and disappeared up the trail, so I made my way to where the guide had stood and squinted up into the canopy, high up into the shadows and recesses of giants. But, try as I might, the resplendent quetzal, with bright blue head and shock red breast refused to cooperate. So, I sat back down and enjoyed spectacle of the forest, listened to the sounds all around me and dug into my pack for a snack. Next up the trail a handful of sixty-something expatriate retirees meandered up the way. They too came to a halt and peered along the path of a pointing woman in their party. A couple nodded with pleasure and one or two craned their bodies and necks to follow the gaze of the others. From my bench I followed their leering high up into the trees but I saw nothing more than wild orchids and hanging vines poking out of the shadows. A moment or two later the group began to move on, back down the trail. I finished my snacks and hopped up to follow them. Striking up a conversation with their guide on the way back down I found out that she was a retired teacher; her son was a graduate of the University of Arizona, and she highly recommended that I urge my parents to move to Boquete when they tired of the desert heat. She loved the spring-like climate, her friends from all over North America, and the magical nature of the valley. “So, about these quetzals—I haven’t seen one yet.” I told her with a grin. Hmph … guess experience helps. We said our goodbyes and I hoofed it back down the trail, stopping to enjoy the views of the mists gathering above the steep canyon walls. As Ulises promised, a little yellow taxi was dropping off a fresh set of hikers at the trailhead. I sprinted the last hundred yards and jumped in. “Where to?” the driver asked in English. I told him I’d like to go back to Boquete, the central park, to check out the town a little bit. Before I had a chance to form much of an argument we were zipping off and into the heights of the Bajo Mono neighborhood. The tour ensued, passing a trout farm and cliffs with splendid views of Boquete below. We stopped briefly to pick up children in blue and white school uniforms. They politely crammed into the back seat and off we sped again before dropping them about a mile down the road. They gave the driver a bit of change and thanked us for the ride. Traveling in Panama, it helps to know a little bit of knowledge about baseball. Panamanians are proud of their baseball stars, so we discussed the virtues of the great Mariano Rivera and Rod Carew while the rest of the tour faded into a brief history of Panama and the major leagues as we drove by rancheros and coffee farms, back down the hill and into town. When we pulled up to the central park I braced for the fee for my “tour,” knowing full-well that it would have been a long, long haul back to town without the taxi. “Ninety cents,” he announced with a broad smile. “I’m sorry, what was that?” I asked him. Indeed, I had heard correctly, so I dug into my pocket for some coins and left him with a generous tip. Near the park I found a little open-air ice cream shop that offered grilled food and tasty frozen treats. I put in my order for a Cuban sandwich with fries, a Diet Coke, and a scoop of vanilla on a cone. The young women working behind the counter contained their laughter as I tried to work out the word for “cone” in Spanish to no avail. We managed, and I took my lunch back to the park to watch the busy town life all around. Stalls sprang up in the early afternoon, offering the typical touristy fare from t-shirts and sunglasses to more traditional brightly colored molas of the Kuna peoples and woven crafts of the Ngobe Bugle tribe. Vacationers and locals milled about and chatted or browsed at the stalls, backpackers wandered into the hostel across the street, and life passed by at an appealing pace. I took a turn around the stalls to admire the molas and look at a couple of T-shirts before heading back to my little cedar cabin and an evening of cool breezes, left-over roasted chicken, and thumping Latino music from a birthday party at the house next door. The whole neighborhood must have turned up by the time the piñata broke into a dozen pieces, and children squealed in delight as they raced about the manicured yard. Later, grown-ups danced away the night under the stars and beneath an old oak tree softly glowing under white Christmas lights. The party mellowed as the night wore on and just before midnight the last dancing couple, a pair of abuelos whirled around the yard with the grace and humor known of a deep love and years of understanding. Smiles transcended language as the music caressed neighbors who watched with contented faces until the party broke up precisely at midnight. I slept in Sunday morning and when I woke, lounged at ease with some reading and the internet, enjoying some soccer on the TV in the background, but mostly relaxing in the cool. I felt in no hurry to go anywhere or accomplish anything significant. Time passed pleasantly. By noon I broke a couple of eggs and cut up an avocado and a tomato for an omelet. After a late brunch I threw a few things into my backpack for a hike and trekked back to the highway to catch a mini-bus into town for a transfer to a taxi up the hill again: my destination, Finca Lerida, one of Boquete’s premier coffee farms, renowned for its beautiful grounds, great coffee, and several kilometers of hiking trails. The taxi dropped me off at the entrance to the farm. A gatekeeper greeted me, took my name and asked what my business was at the Finca Lerida. 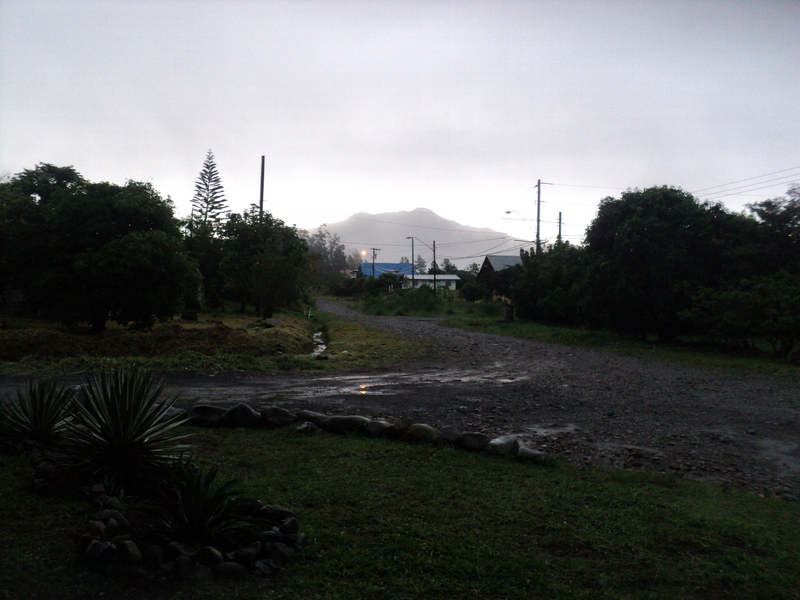 I explained that I might enjoy a cup at the coffee shop and then take a little hike if time permitted, noting the ominous looking afternoon clouds building up beyond the volcano. He smiled and waved me through. 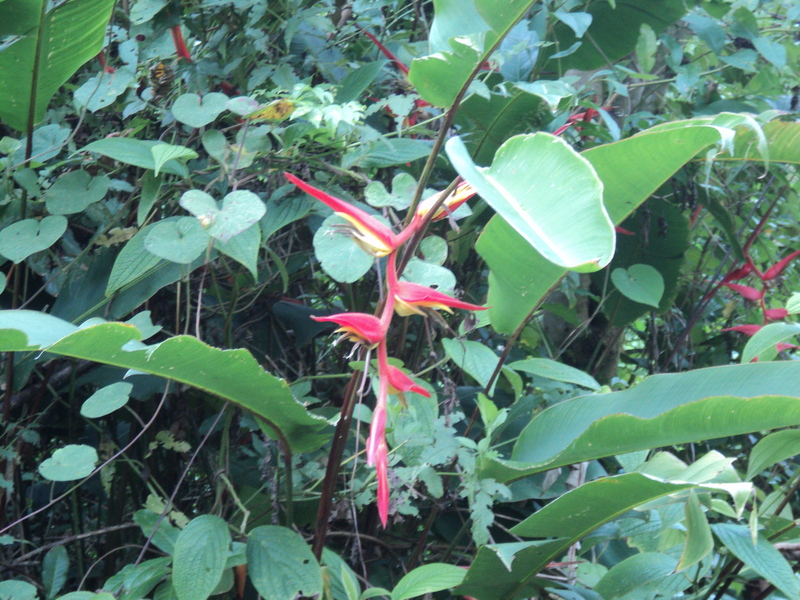 Tall hedgerows, flowers, and gardens broke up the groves of coffee trees in a pleasing fashion. Turning the corner at the far end of the drive, the Finca Lerida loomed above in resplendent color. I may not have found my quetzal in the valley of hidden waterfalls, but the beautiful landscaping of the coffee shop, guest house, lodges, and restaurant was not a bad second. Happily, I proceeded upward toward the buildings, entranced by the dazzling array of colors and geometric lines of coffee trees broken up by hedges as they climbed up and over the rolling hills and valleys of the farm before disappearing into the distant rainforest and then misty clouds above. I poked around the old coffee shop for a few minutes, admiring the view from the second floor of the farm’s old machine works and warehousing. I’m sure this place has stories to tell. But, the lure of the grounds and the promise of more hiking were too much to resist, and skipping my coffee I set off, up the drive past the lodges, restaurant, and guest house nestled among flowery gardens and a reflecting pool. At the end of the beautiful way an old wooden sign pointed to a golf-cart sized trail heading up the hill and into the groves of coffee trees—steeply so—“SENDEROS” it read. I began my crawl up the trail, stopping every several hundred yards at each new vantage point to catch my breath and admire the descending clouds above and the magnificent views of Boquete below. The whitish-gray mists seemed to creep down closer by the second and I began to grow a little uneasy about getting caught in the middle of a lightning storm, trekking alone up the foot of the mountain. But, the clouds showed no malice beyond a slight spitting rain as they settled in just above of the forest about a quarter mile up the trail, neatly framing two towering trees adorned with vines and flowers. Stopping short of this heavenly threshold would be a crime and so I soldiered on. As I trod up the path, a little bird flew down from a hedgerow, chirped intently, and hopped along the trail before me, motioning for me to follow toward the looming giants now bathed in the other-worldly mists. I felt as though I were stepping into a Disney movie and just beyond this magical portal nymphs and sprites danced amidst the trees. Onward and upward I climbed, leaving the groves behind, pausing briefly before the towering masses to peer high up into their bows for my elusive quetzals, but none were to be found. Ahead, the trail disappeared into the clouds, and as I climbed higher still, calm settled in around me and I felt like an explorer, half expecting floating islands to rise up out of the mists, filled with primordial wonders. I labored on, following the grassy curves of the trail up and through the white until breaking out above the clouds near the end of the sendero. At the apex of the trail benches invited my tired legs to relax for a while and take in the spectacle below. 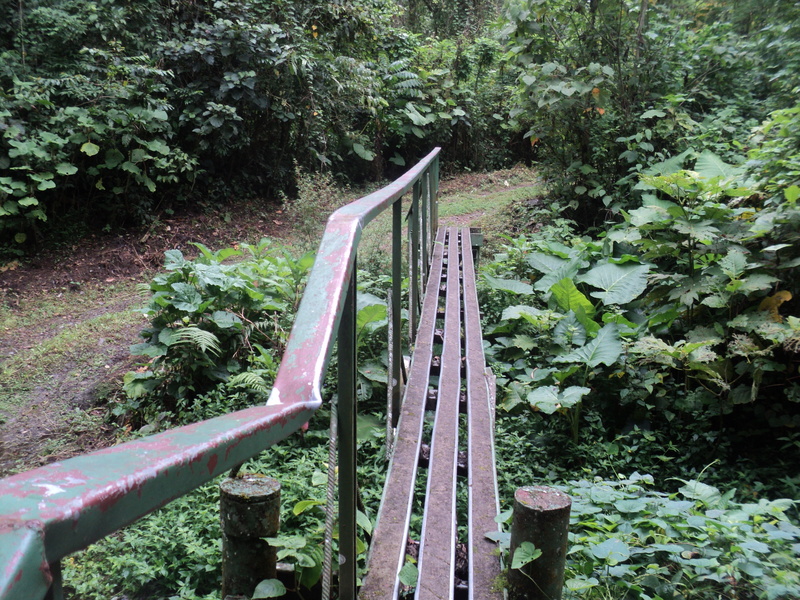 Dark little paths disappeared into the dense rainforest and up the slopes of the volcano. Beyond, the clouds hung about the valley and ridges of the mountainside like shrouds, and in my mind’s eye a blue and red blur shot across the cloudscape and into the sunlight. I watched as flocks of birds broke from their nests and soared above the clouds from grove to grove. Noises from the restaurant and the stirring of some guests far below interrupted my moment of zen, and my stomach reminded me the hour was growing late. I made my way back down the mountain with begrudging footsteps and settled in to enjoy a meal on the covered porch of the gourmet restaurant for a fine grilled fillet of beef and garlic potatoes, and, of course, an outstanding café con leche that arrived just in time to fend off a slight chill from the drizzling rain. Contented with Boquete, I sipped my coffee and relished in the endless varieties of green dotting the hills, reflecting upon a marvelous weekend. Travelers can also enjoy a variety of places to stay in Boquete to suit nearly every budget and taste, from the hostel just off the central plaza to upscale eco-tourism. Zip-lining, horseback riding, white water rafting, hiking, off-road vehicles, and birding draw adventure seekers to the valley year round with the promise of great weather and friendly faces. For those who wish to spend time at the beach, Panama’s beautiful Pacific coast is just a short drive away, promising fun in the sun and golden sands, making Chirqui Province a great vacation destination. 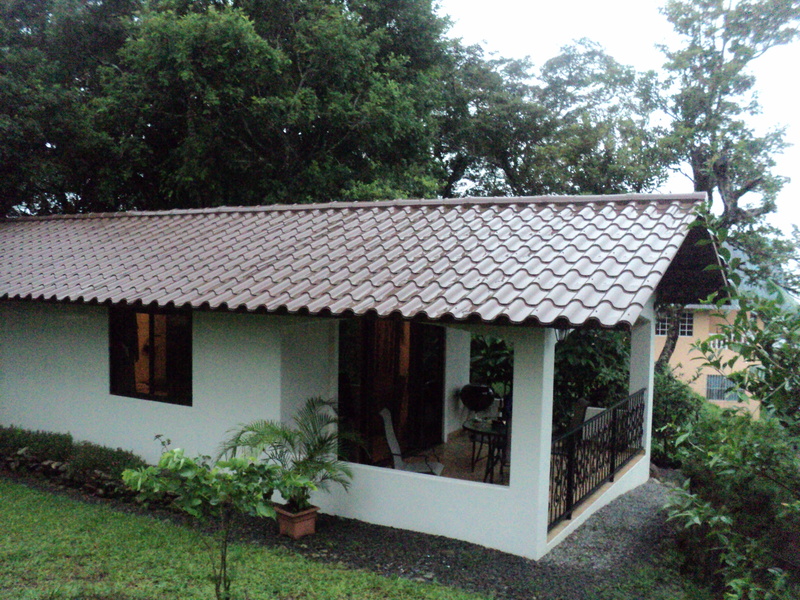 For information on the Sunset Cabin in Alto Boquete contact Ulises Guerra at: ulisesbhre@cwpanama.net. Jason Godfrey teaches literature and composition in Tempe, Arizona. He’s a dedicated soccer enthusiast and avid Arizona outdoorsman, but enjoys trekking to various corners of the globe for vacation adventures. What a fabulous trip. Love the details about Boquete. 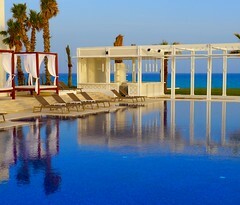 I can imagine being there! I wish I’d gone during my trip to Panama. Next time …. Many thanks for your comment and I’ll pass it along to Jason! Sounds like a great place to visit. Interesting adventure. Thanks! I’ve passed your comment on to Jason as well.